If you see a mom riding her electric cargo bike with her kids around Hood River, it’s a good chance it might be Megan Ramey. As a planning commissioner for the City of Hood River, and the founder and chief traveler for BIKABOUT, Megan Ramey bikes in search of people, adventure and experiences. Megan remembers the day she decided to purchase an electric bike. She had moved to Hood River from Boston with her husband Kyle and her daughter Annika and their fleet of seven bikes, but was quickly daunted by the hills she had to conquer every time she needed to go to the grocery store in the Heights. Now she is able to cruise up the hills with ease. 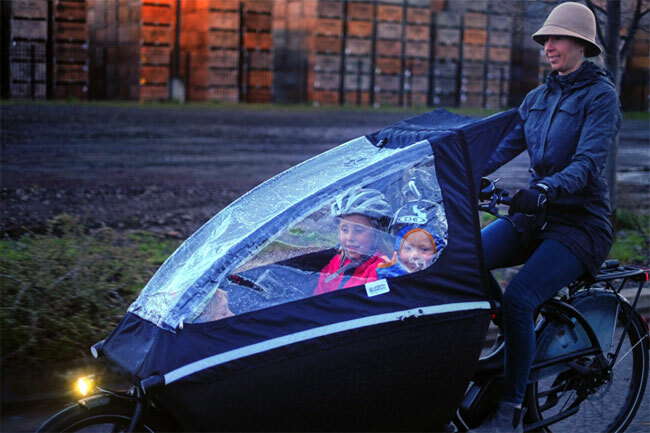 “We had always lived a mostly car-free life,” she says, “but suddenly I was faced with the reality of Hood River’s challenging terrain.” Rain or shine, Megan is often seen pedaling her two kids around on her Dutch-style Urban Arrow electric cargo bike. When she first started using the bike as her main mode of transportation, people would stop and stare. Now Ramey says that she sees so many families sharing the ride on e-bikes that she can’t even keep track of who they are anymore. “Yesterday I saw a woman in her 70’s on an e-trike go past my house on Belmont, followed soon after by a woman on a long-tail e-bike with three kids riding in back,” she marvels. Megan wants people in all cities to be able to enjoy their urban environment by bicycle, so she also runs BIKABOUT, a website that inspires two-wheeled tourism in great biking cities. Her vision is for people in cities to live a life by bike. And when it’s normal to see a mom like her biking her toddler around, or kids biking to school or an elderly couple riding next to each other, her dream will be realized. As the City of Hood River Planning Commissioner, Ramey is helped the City to promote the annual Oregon Drive Less Challenge in October 2018, spearheaded by Mid-Columbia Economic Development District. For more information on transportation options in the Gorge, visit their website.